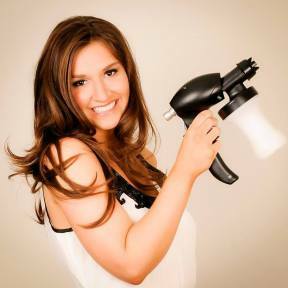 Aldie resident Jennifer Wignall is shining a different light on the tanning industry. The time has come to ban the act of baking in a tanning bed. Take a moment to wash clean of orange streaks and rinse off the potent stench of chemical-laden creams. Tanning, at its core, is a practice laced with a tinge of egotism. It’s akin to whitening, waxing or other self care regimes and is not exactly a must-have service. Or is it? Jennifer Wignall is introducing a safe way to get that glow. Jennifer was once a lifelong tanning bed user who visited the salons on a routine basis to obtain and maintain a bronzed glow. She loved the way she felt with tanned skin. Years later, after her twins were born and she suffered a bout of Melanoma – of which she has since fully recovered – the entrepreneur decided to drop tanning beds altogether in favor of spray tan. But the best of intentions are not always well met and she suffered an allergic reaction to the spray tan. “People don’t realize that your largest organ is your skin. What goes into your body is just as important as what goes on it,” she said. Instead of retreating to a life of pale and insipid skin she took matters into her own hands. She has a medical background, a natural curiosity and built-in gumption that helped her as she dove into research of the ingredients of typical spray tan solutions. She spent months breaking down the chemicals and striped bare what wasn’t needed. The Organic Bronzing Station was born. The company is not a vanity project for Jennifer. Sixty percent of materials placed on the skin are absorbed into it. Over time this can be toxic to overall health. Armed with this knowledge the 28 year-old mother of two twin boys then developed her own custom formula that is organic, vegan and gluten and paraben-free in 2013 and the company was born. The spray is high quality and high-end. It runs an average $50 for a seven-to-10 day tan and is currently found in 33 stores throughout the Washington, D.C., metro area, Florida, Arizona and New York. She hopes to hit 75 partnerships by the end of this year. The product has four strengths that blend nicely with people of all skin tones and nationalities and clients discuss their ideal color with consultants who create a customized experience. The goal is to give clients a glow or a step or two darker than they’re natural color. Jennifer isn’t aiming to transform anyone. She just wants to let them shine. Previous PostCigna on customer-centricity & experienceNext PostYou’ve got HRSS questions. They’ve got answers.